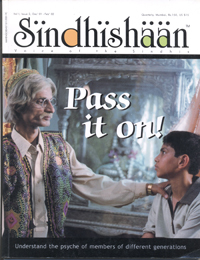 Sindhis, the inheritors of the oldest civilization in the world are always in a state of flux. Since time immemorial Sindhis have faced hardships one way or the other. Invaders from the West used to repeatedly attack Sindh and plunder its wealth. Even the ruins of Mohen-jo-Daro indicate the demise of the finest society at the hands of some greedy aliens, though natural calamities could have played their part too. Jawaharlal Nehru in his book “Discovery of India” took pride in the Indian civilization citing the richness of Mohen-jo-Daro architecture, culture and civilization but left the poor Hindu Sindhis to fend for themselves when India was partitioned on August 15th 1947. Punjabis got a part of Punjab while Bengalis got their own share of land and unlike the Sindhis were not labeled as refugees, while being easily assimilated into mainstream India. Sindhis are sometimes compared to the Jews as they show exemplary wisdom to not only survive in the harshest of environments but also prosper. The Jews had also been subject to persecution which had followed them into every haven in which they had taken shelter during their dispersal. Dagobert, King of the Franks drove them from Gaul, Spain’s Visigoths seized their children as converts; the Byzantine emperor Heraclius forbade Jewish worship. Most countries barred Jews from owning land. The church forbade Jews to employ Christians, and live among Jews. Most loathsome of all was the decision of the Fourth Lateran Council in 1215 AD to stamp the Jews as a race apart by forcing them to wear distinguishing badge. In England it was a replica of the tablets on which Moses received the Ten Commandments. In France and Germany it was yellow, forerunner of the yellow stars with which the Third Reich would one day mark the victims of its gas chambers. The Republic of Venice enriched the vocabulary of the world with the word ‘ghetto’ from the quarter Ghetto Nuovo – New Foundry – to which the Republic restricted its Jews. And the most cruelest act upon the Jews was the systematic slaughter of six million of their kind in the gas chambers of Nazi Germany. Now as one goes through the history of Sindh, one realises in the days of Ghulam Shah Kalhoro (18th century) Mullas became so powerful that they issued an edict through the government giving preference of Muslims above Hindus, denying Sindhi Hindus their due respect. Talpurs (1783 – 1843) even surpassed Kalhoras in ill-treatment of Sindhi Hindus. They were prohibited from using certain rides. At many places in Sindhi Hindus had to even hold their footwear in their hands. They were directed to wear humiliating dresses. Many Sindhi Hindus were forcibly converted to Islam oftenly on flimsy grounds. The partition inflicted heavy blows on the Sindhi Hindus. They had to flee their homes in a huff leaving behind everything and proceed for the uncharted turfs of India. The seed of hatred were sown a long time ago in 712 AD when then Muslim Governor Hajjaj-bin-Yousuf sent his son-in-law and trusted general Mohammed-bin-Qasim to invade Sindh sensing its richness. King Dahar of Sindh couldn’t withstand this onslaught from the sophisticated army of the Arab invader. The intrigues and betrayals of his compatriots also played its part, resulting in the subjugation of the Sindhis to Arabs. The seed of hatred, sown in 712 AD was reaped in the shape of the large scale uprooting and migration of Sindhis from their homeland in 1947, soon after Independence on the ground that they were not Muslims. Thus Sindhis were divided on the lines of religion. Sindhi Hindus were in the forefront of freedom movement before partition. A host of Sindhi leaders worked for independence of India and a brief description about them won’t be out of place. Acharya Kriplani (1888-1982), the best known of them, first met Gandhiji in Shanti Niketan and was hooked on to him for life. Here was a remarkable case of front rank leadership for 60 historic years. Jairamdas Daulatram (1891-1979) a scholar turned patriot was the most Gandhian of the Congresmen of Sindh. After Independence, he became the Governor of Bihar and Assam. His over-enthusiasm for Hindu values divided Sindhis into pro-Arabic script and pro-Devnagari script, parts. But in his last years, he worked for recognition of Sindhi language by Indian government which bore fruit in the days of Prime Minister, Ms. Indira Gandhi on April 10, 1967, when Sindhi language was brought under 8th schedule of the Constitution of India. Dr. Choitram Gidwani, Prof. Ghanshyam Shivdasani, Harchandrai Vishindas Bharwani, Ganga Behn, Ambi Khilnani and Kumari Jethi Sipahimalani played a significant role in the social life of Sindh. India finally gained Independence on the midnight of 14-15 August 1947 and a new country, Pakistan was created, resulting in large scale violence and migration. Sindh was comparably a peaceful oasis in the desert of violent India and Pakistan. Hordes of Bihari and UP Muslims swarmed Sindh and Liaquat Ali Khan, the first Prime Minister of Pakistan (himself a Mohajir), in order to get these people settled in Sindh engineered Anti-Hindu riots in January 1948, forcing Sindhi Hindus to leave their old haven and proceed literally empty-handed to a new land called India. The plight of Sindhi Muslims was different as they were not permitted to purchase evacuee property left by Sindhi Hindus. They were denied any government services, the whole of Sindh hadn’t even a single Sindhi Deputy Commissioner (Collector) to boast off. First ever Constitution of Pakistan of 1956 amalgamated Sindh into a unified province of West Pakistan. Sindhi Muslims had opted for Pakistan to get justice and reprieve from Hindu influence, but were shocked to see the treatment meted out to them by their new rulers. Denying genuine aspirations of Sindhis, an alien language Urdu was imposed upon them as national language. In the name of rewarding servicemen the fertile land of Sindhis was distributed amongst Punjabis. The large scale infiltration of Mohajirs (Indian Muslims) and Punjabi – Pathans into Sindh has led to demographic imbalance in Sindh. The plight of migrant Hindu Sindhis was worse in India. Landing in Bombay was just the beginning of their long hard road to settlement, because they did not know what to do next? Approximately 12 lakh Hindu Sindhis migrated to India in the wake of partition. They were dumped into the empty military barracks at Chembur, Thane, Kalyan, Pimpri etc. Their first attempts at settlement and rehabilitation were the setting up of small shops in wooden sheds. Their business policy of “larger turnover at lower profits” reaped them rich rewards. Sewing, embroidery, preparation of pickles, papad etc. became a source of income for needy women. The manner in which Sindhi refugees toiled earned them the praise and admiration of locals and their leaders. The need for providing education to Sindhi children was also addressed. Dharamdas R. Khashtriya opened the Model High School for Boys near Kennedy Bridge, Grant Road and another school, Girls Model High School at Dadar. Lachhiram Matta opened two high schools, one at Chembur and another at Ghatkopar. Sindh Educationists’ Association constructed Jai Hind College at ‘A’ road, Churchgate, with T. M. Advani as Principal. Later on he became vice-chancellor of Bombay University. Mr. K. M. Kundnani and Barrister Hotchand Advani with the help of Lokumal of Kishinchand Chellaram firm, under the auspices of Hyderabad (Sind) National Collegiate Board, opened up National College, Bandra and K. C. College at Dinshaw Watcha Raod, Churchgate and Vivekananda Education Society led by Hashu Advani established Arts, Science, Commerce and Engineering colleges at Chembur. Many more such colleges were opened in Ulhasnagar and other parts of Bombay. Sindhis have contributed in the field of medicine too. Jaslok Hospital at Peddar Road, Hinduja Hospital at Mahim and Inlaks Hospital at Chembur are testimony to that effect. Sindhi Hindus, even in pre-partition days used to seek new territories worldwide. Shikarpuris used to carry on banking activity named ‘HUNDI’. Sindhi traders established their business in the Middle East, specifically at Dubai and other parts of the world, such as, Gibraltar, Spain, England, America and South East Asia. Sindhis are concentrated in countries like Hong Kong, Taiwan, Indonesia, Malaysia and Singapore. Prominent among overseas Sindhis, popularly known as Sindhwarkis are Hari N. Harilila, K. Sital, Gopaldas Mahbubani, Gian T. Vachhani, Larry Parmanand, L. R. Lulla, Uttam D. Chotirmal, Parmanand T. Balani, Khubchand L. Daswani, Ram Buxani, Murijmal Manghnani and Govind Daryanani etc. The list is just indicative and it should not be construed as exhaustive. In India too, Sindhis have succeeded in establishing themselves in different fields of business, eg. Hindujas of Ashok Leyland, Mirchandanis of Mirc Electronics (Onida), Mulchandani of Baron (AIWA), Chhabrias of Finolex, Advanis of Blue Star and many more. In Sindh, Pakistan, Sindhi Muslims also proved their mettle. In Pakistan, Lahore is regarded as centre of politics and culture. While in Sindh, Larkana has proved to be more than a match to Lahore. It has provided many leaders to not only Sindh, but Pakistan too. Mohd. Ayub Khuhro was Chief Minister of Sindh, who later on became Defence Minister of Pakistan. Qazi Fazulullah was also Chief Minister of Sindh and then Home Minister of unified province of West Pakistan. Sir Shahnawaz Bhutto was Prime Minster of the erstwhile state of Junagarh, in India. His son Zulfiqar Ali Bhutto rose to become the youngest federal minister in the cabinet of President Ayub Khan. Later on he parted ways with his mentor and launched an agitation against Ayub Khan in 1967, resulting in another coup d’etat in Pakistan. Ultimately after the loss of 1971 war of East Pakistan, he became the first ever civilian Martial Law Administrator of Pakistan on December 20, 1971. His hand-picked Punjabi Gen. Zia ul Haque removed him in another coup d’etat on July 5, 1977 and subsequently killed him on 4th of April 1979. His daughter Benazir Bhutto launched an agitation against the dictator Gen. Zia ul Haque and succeeded him as the first ever Pakistani woman Prime Minister in 1988 but was removed in 1990. In India, Sindhis have by and large avoided politics and rather concentrated on business activities. Very few names can be cited in this regard. A prominent name among them is of Lal Krishna Advani. Presently he is the Union Home Minister and is regarded as most powerful home minister of India, after Sardar Vallabh Bhai Patel. The Sindhis are peaceful, hospitable, hardworking and open minded people. They are free from inhibitions of caste and creed. The Sindhis are cosmopolitan in their outlook. Sindhis are the only Indians who don’t belong to any single state and simultaneously belong to all states of India.